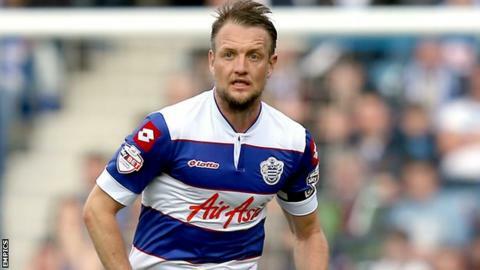 Queens Park Rangers captain Clint Hill hopes his side can embrace the pressure of the Championship play-offs. The west London side travel to Wigan in the first leg of their semi-final on Friday and host the reverse on Monday. "Your form goes out of the window, no matter where you finish," the 35-year-old centre-back told BBC Late Kick Off London and the South East. "It is all about how you handle the occasion on the night. We're positive and excited." Friday, 9 May: Wigan v Queens Park Rangers, 19:45 BST. Monday, 12 May: Queens Park Rangers v Wigan, 19:45 BST. Rangers finished the regular campaign in fourth place after beating relegated Barnsley 3-2 at Oakwell on Saturday. Harry Redknapp's side had been challenging for an immediate return to the Premier League, but fell away from the automatic promotion places after suffering five defeats in February and March. "If we're being honest we haven't quite been good enough all season to stay in that top two," Hill added. "The two teams which have gone up have been fantastic and consistent. I think key injuries have hurt us. "We are not a high-scoring team and we lost Charlie Austin for a large part of the season and Matty Phillips as well. "We've lost 12 games and that says it all. We are strong at home but we couldn't match that record when we went away." Hill, who won the Championship title with QPR in 2010-11, is open-minded about their semi-final tie with Wigan. "There will be a few nerves as well, but you never know what is going to happen," he said. "We have got a lot of people who have got experience and are vocal. We all want to drive each other and all want to achieve the same thing, which is Premier League football. "Now is the time to stand up. It has got to be done now or we all go on holiday feeling sorry for ourselves. "This is what we are in the game for and we have got to be ready for it. "Hopefully we can get to Wembley and who knows where it may take us."